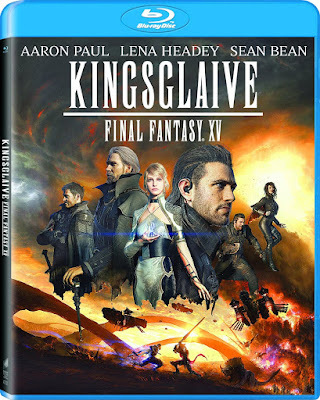 In terms of cross-promotional creativity, I must give credit to Kingsglaive: Final Fantasy XV, a movie meant as a viewing companion to the newest video game. Much of the computer animated film resembles the cutaway scenes featured between game play, which often makes the lack of audience participation even more noticeable. Though the visuals are remarkable, this glaring issue with video game films is only increased in a movie that is included with the purchase of the game. If nothing else, this film should have the ability to encourage viewers to play the game instead. Meant to serve as a narrative companion to the story within the latest game in the franchise, it is difficult to know what aspects of the plot were meant to be familiar to me. With little to no knowledge of the franchise remaining in my brain since the last film installment, I was entering the narrative blindly and found an overwhelming amount of backstory and plot-significant mythology. While the details of this world’s social hierarchy require somewhat of a learning curve, there are transparent themes in the narrative which are commonplace in the science fiction genre. Convoluted as the plot may be, there is little beyond the cutting-edge animation in Kingsglaive that hasn’t been done before. The storyline for Kingsglaive involves the magical kingdom of Lucis, which is home to a sacred crystal with powers that the rival empire of Niflheim longs to possess. King Regis (voiced by Sean Bean) is faced with an impossible dilemma under the pressure of Niflheim’s attacks, relying on the efforts of his elite soldiers known as Kinsglaive. Among the greatest of the soldiers wielding the power of the king’s magic is Nyx (Aaron Paul), though he is a lower class citizen looked down on for his nationality despite the abilities given to him by the king. Despite being the best fighter in the army, Nyx must live with being treated as a second-class citizen. Though there is a convoluted plot with too many characters, political undertones and social commentary, this is really just a movie for a polished visual showcase of the video game action. The highlight of this comes from the Kingsglaive’s ability to use swords as a means of transporting short distances, a tactic used copiously throughout the many scenes of animated sci-fi spectacle. I would not be surprised to see this effect used in a Hollywood blockbuster in the future. The animation is impressively refined, even when the narrative often jumbles together an incoherent number of derivative storylines. Even if little of the story has stayed with me, there are some spectacular visuals in the realistic animation of Kingsglaive, making the high definition presentation a must for any interested. Animation has long been the greatest benefactor of enhanced viewing formats, and this film is no exception. The Blu-ray disc of this film is included in several of the releases for the new Final Fantasy game, serving as a companion narrative to the one in the game. The film is also available in this standalone Blu-ray release, which also comes with a Digital HD copy. The special features on the disc itself have four featurettes. “A Way with Words” features interviews with the filmmakers and the English-language voice actors (Aaron Paul, Lena Headey, and Sean Bean) about the process of creating the audio track for the film. “To Capture the Kingsglaive” is a fitting companion featurette, exploring the process of motion capture in creating the visuals to go with the audio. The other two remaining features also deal with the visual and the audio, though from a design perspective rather than performance. “Fit for the Kingsglaive” looks at the development of the visual look of the world within the narrative, whereas “Emotive Music” is about the creation of the score.